I love bruschetta! I’ve loved bruschetta since the first time I set tastebuds on it in 1989 or so. Through the years, I’ve made bruschetta of various persuasions, one of which even ended up here in 2009. So I was wondering if there was really anything new for me to learn about such a simple and well practiced appetizer. It turns out there was! First of all, you don’t need anything except tomatoes, fresh basil, salt, pepper, olive oil, garlic, and bread. Forget the cheese, the olives, the balsamico, and any other sort of faffy ingredients that might tempt you. Second of all, grape tomatoes are the best tomatoes for bruschetta because they have less water and more intense flavor than most other types of tomatoes. Ours were from Sicily! And finally, in the interest of avoiding garlic overload, it’s enough just to rub the toasted bread with a garlic clove, you don’t need to add crushed garlic to the topping. Heat the oven to 120 degrees (250 Fahrenheit). Cut the bread into 1-inch thick slices and arrange it on a baking sheet. Bake it until the tops are lightly toasted, then flip it and do the same to the other side. In the meantime, chop the tomatoes very small. Mix them together with shredded basil leaves, salt, pepper, and a drizzle of olive oil. 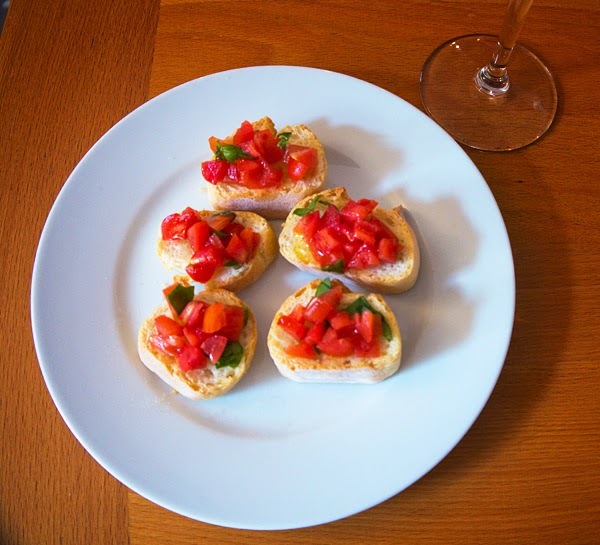 I love a good simple bruschetta. Grape tomatoes? That’s good to know. And how do you pronounce bruschetta? I’ve always said brus-ketta, but I hear others saying bru-shetta. It sure was a great cooking class and it was lovely to meet you and Robert. Hi Mia! Thanks for leaving a note :) We enjoyed meeting you and your family, too and hope you enjoyed the rest of your travels! Have you made ravioli yet?